A blog and The Life In Between : Hair Care Routine. 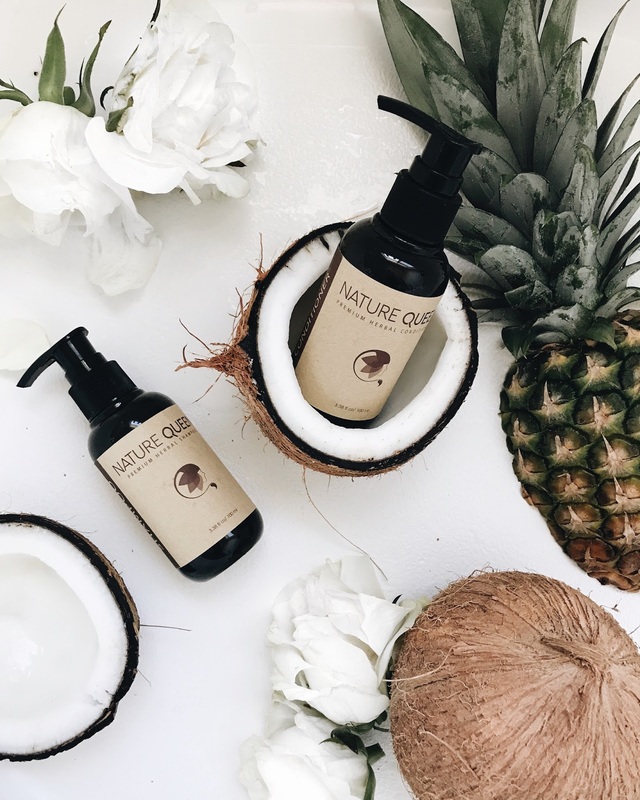 Natural products you'll want to try. Behind every perfect hair there are multiple products that go into maintaining the hair healthy so I think it's extremely important to begin with a good foundation at home. 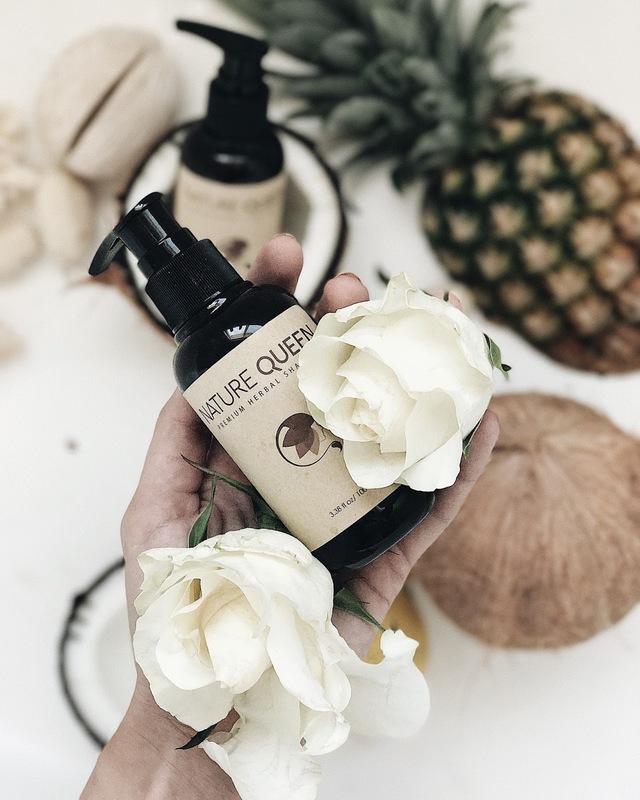 Today I am going to share one of my newly tried products by Nature Queen which you saw a few weeks ago via Insta stories of me unboxing it. I will try to update this "BEAUTY" section at least once a month and share my feedback on different products I try. Because I have never tried Nature Queen products before so I wanted to use it at least for two weeks and do multiple hair washes to give a review based on my own experience. When trying something new that my scalp, skin or hair isn't used to I always go for a travel size. Once I do the little trial run and make sure I love the product I then purchase larger sizes. However, I do love travel sizes for almost everything I have as it makes it easier to pack and save space in the bathroom. A little background on my hair. Some of you may not know but a few years back I had jet black hair. You can only imagine how damaged my hair got as I had a slight obsession with not showing brown roots that were peeking out every few weeks. Thankfully a few years back I grew out of this desire of wanting to have black hair and exotic light eyes lol [ ugh those good, old teenage years ] and decided to have a more natural look. Well, the process wasn't easy I had to dye my hair over and over and slowly switch to light brown with blond highlights. Because my hair is pretty damaged I am always up for trying out new Brands to see what works best. I am also a strong believer in Brands that offer natural ingredients and rarely ever purchase hair products from pharmacy stores. We're all used to buying shampoo etc. while grocery shopping but let's be real all those products shouldn't even be in there, they should be placed in a hair store along with other great hair products and not with food items. If you follow along on Insta stories I had a moment of a breakdown after burning my arms with hair tools and not being happy with dry, unhealthy looking hair. I saw a fellow blogger babe try out these goodies so I had to check out the Brand as well. When I saw all the ingredients are natural, have no added color or fragrance and are herbal I knew it was a great fit! The focus of Nature Queen is to cleanse, reduce hair loss, restore shine & volume and detoxify. Ingredients used in the products also don't dry out your hair or scalp which is great as I dry hair creates an unhealthy, not shinny look. I will also keep an eye out to see if they will be adding new products to their line such as hair oil etc. After about 8-10 washes I loved how my hair no longer felt and looked dried out and most importantly Adam even said it smelled good haha [which by the way he never says due to the hot tools I use on the hair]. If you're looking to add a new hair care products into your weekly routine or want to get these little travel size goodies for your upcoming getaways I highly recommend them ladies! Get 20% off your order by using my code SKY20. Click on HERE to shop. 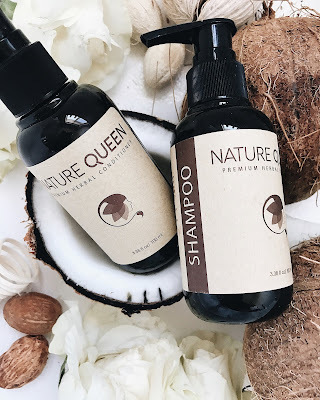 Thank you Nature Queen for partnering with me on this post.